Mass Flow Controller Calibration Report - What Does it Mean? This calibration complies with ANSI/NCSL Z540-1-1994 and ISO 17025-2005 [non-accredited] and is traceable to the National Institute of Standards and Technology. This validation was accomplished by qualified personnel directed by controlled procedures. The accuracy of this calibration for any gas other than the actual gas used may be subject to theoretical corrections. Customer Service can be contacted weekdays 8AM-5PM EDT at 1-800-950-2468. Let’s start with part of the first sentence, “This calibration complies with ANSI/NCSL Z540-1-1994 and ISO 17025-2005 [non-accredited]…” According to the NCSLI webpage , there are two national standards for calibration laboratories. These are Z540-1 and ISO 17025. There are some differences between the two standards. And the aforementioned NCSLI gives a detailed description of both. In short, 17025 is appropriate for both calibration and testing labs whereas Z540-1 addresses calibration labs only. 17025 requires that the laboratory be a legal entity that can demonstrate competency, which includes thorough analysis of the uncertainty associated with the calibration services. Another difference between the two standards is that 17025 places the responsibility of the calibration due date on the end-user. In other words, the calibration lab should not determine the customers calibration cycle. 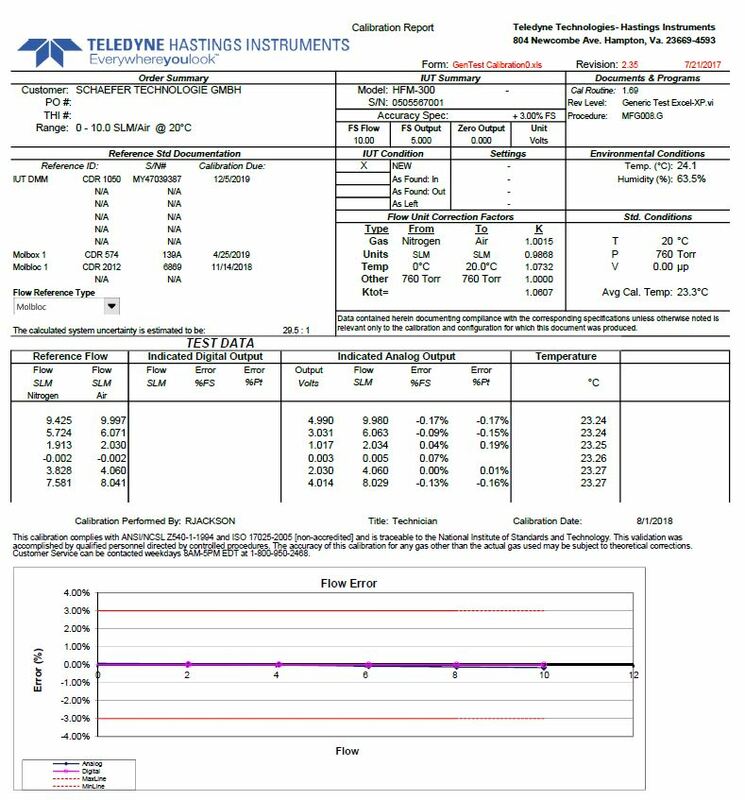 That is why you no longer see calibration due dates on Teledyne Hastings’ labeling. OK…. if 17025 is the latest, greatest, and accepted around the world, why do we still even list Z540-1 on our calibration reports? Because, we still have customers who adhere to Z540-1 and need the statement on their paperwork. What about the word “non-accredited” that appears in parentheses? While we strive to conform to ISO 17025, which includes rigorous internal audit review, it has been our position that as a manufacturer, it is not necessary / appropriate for us to invest in the accreditation activities and third party audits. However, we do recognize the depth and critical nature of the standard. Because of those criteria, we have chosen to compose our procedures and train our personnel to be in compliance with the standard. So to be clear, Teledyne Hastings is not accredited to ISO 17025. Let’s move on… what do we mean by, “…traceable to the National Institute of Standards and Technology”? Simply this, we can provide an unbroken chain of calibration documents that connect your calibration back to NIST, the National Institute of Standards and Technology. Now here is a trick question… does a NIST traceable calibration tell us anything about the uncertainty of the calibration? The answer is, “no”. For example, we could calibrate one of our most advanced mass flow controllers, the HFC-D-302B 300 Vue which has a stated uncertainty of ± (0.5% of Reading + 0.2% of Full Scale). – or we could calibrate our HFC-202 flow controller (±1% of full scale using the same metrology and the stated uncertainty for each instrument would be the same as before. In other words, the performance of these instruments does not improve just because a NIST traceable standard was used. 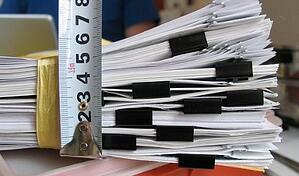 One more note, some customers request “Backup Documentation” to their calibration data reports. In other words, they want copies of the calibration reports of our metrology that form the unbroken link from their calibration back to NIST. There is a nominal administrative fee to collect, scan, compile, and email these calibration reports for each individual piece of metrology that was used. Does everybody need the Backup Documentation? Usually not, but enough customers request these so it is a service that we offer. Quite often the reason why our first tier customer will request the additional supporting calibration reports is because they are manufacturing complex assemblies that their higher tier customers are procuring with the aforementioned unbroken chain back to NIST as a purchase order flow down requirement. Next, we have the sentence, “This validation was accomplished by qualified personnel directed by controlled procedures” This gives us an opportunity to tell a little about our ISO 9001:2015 Quality System. As a key part of our system, all assembly and calibration personnel must complete rigorous training and demonstrate proficiency before working on either the Flow Products or Vacuum Products Teams. Also, every product or subassembly acceptance test, that has a measurable output, is controlled by a top tier Quality System Procedure. The procedures, training program, in fact the entire Quality System is subject to routine internal audit program, third party surveillance audits, and third party ISO 9001:2015 certification audits. Now what about the statement, “The accuracy of this calibration for any gas other than the actual gas used may be subject to theoretical corrections”? 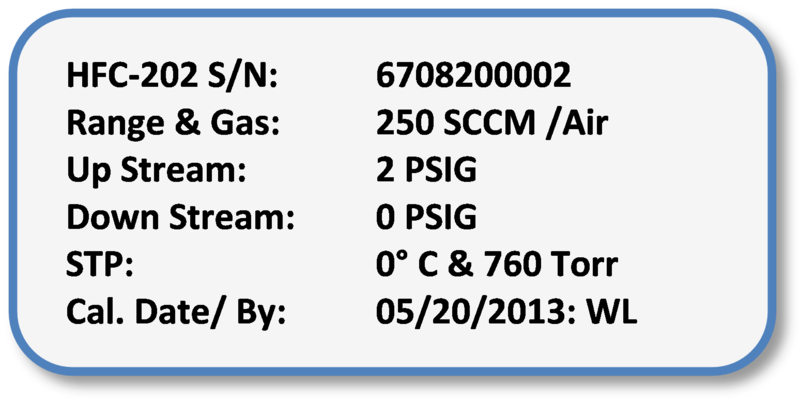 There are certain gases which are hazardous and/or corrosive. While our flow meters and controllers are quite suitable for use in many of these gases, there are several of the gases that we have never (and will never) allow into our facility. So, we use theoretical corrections to map the output of our flow products using the calibration gas to the output for the user’s gas. We are very proud of our metrology and quality programs. And we welcome your questions. If you have a question about mass flow controllers, vacuum gauges, or just want more information about a Calibration Report, we are here to help. 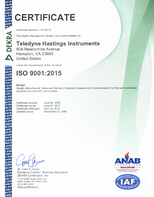 You can contact us at hastings_instruments@teledyne.com or call 757-723-6531 (800-950-2468). We often see the label “One Size Fits All”. This may be fine for some consumer goods. However, it can be quite problematic when applied to items like shirts, gloves, or even golf clubs. “One Size Fits All” also does not work for Mass Flow Controllers (MFC). Not all applications are alike. Forcing a “One Size Fits All” MFC into an unsuitable application can squander accuracy and induce valve failure. Why do you need to specify the gas flow range on a MFC? The Full Scale (FS) Range and Gas on a MFC directly correlates to the transmitted output (analog or digital) of the device. In an analog device, the maximum output value (such as 5 vdc or 20 mA) will be equivalent to the FS value. The accuracy of most MFCs is a function of this FS Range. For analog devices, it is commonly ±1% of FS. For digital devices, it is commonly published to be ±(0.5% of Reading + 0.2% FS). Selecting the FS Range close to an application’s maximum flow rate optimizes accuracy for that specific application. This is a good practice. In addition, the gas must be specified. Most MFCs use thermal based sensors. 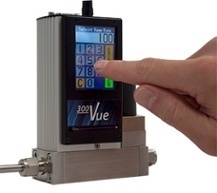 These sensors actually measure the molecular flow rate rather than the mass flow rate. Various gas molecules transfer heat differently, and thus the gas must be known. Why do you need to specify Upstream Pressure and Downstream Pressure on a MFC? Again, not all applications are the same. A “One Size Fits All” MFC is typically not set up for applications at high pressure, low pressure, high differential pressure, or low differential pressure. The definition of high and low will also fluctuate from one user to another. Teledyne Hastings Instruments selects and tests MFC valve components (orifice, spring, etc.) that optimize valve stability for the exact application pressure conditions.When using a Teledyne Hastings Instruments MFC, you will always find the FS Range / Gas and the Upstream / Downstream Pressures listed on the serial number label. Wayne Lewey was first exposed to mass flow controllers while an undergraduate at North Carolina State University (Chemical Engineering). Today, Wayne is the International Sales Manager at Teledyne Hastings Instruments and can be reached at wlewey@teledyne.com.